As more oil and gas facilities come online in the Coastal Bend, the city and port of Corpus — and a handful of private companies — are planning to build a bevy of seawater desalination plants. In 2017, ExxonMobil announced plans to build one of the largest chemical plants in the world just north of Corpus Christi. Known as the Gulf Coast Growth Ventures project, the ethylene cracker — expected to be operational as soon as 2021 — is one of dozens of chemical manufacturing and other facilities in the works along the Texas Gulf Coast as industry looks to capitalize on a newfound ability to export oil and natural gas. Local officials rejoice in the growth — Exxon's project is expected to pump $50 billion into the local economy in its first six years of operation — but say it poses a challenge they are obligated to address: a growing demand for water. While there is plenty to go around for now, they want to add a new and unlikely source to the mix to ensure future demand is met: the salty Gulf of Mexico. "Sooner or later, we’re getting to the point where we need more than what we have now," said Jim Lee, an economics professor at Texas A&M University-Corpus Christi who is advising the Port of Corpus Christi on a controversial proposal to build a seawater desalination plant. Seawater desalination involves separating dissolved salts and other minerals from ocean water, and it appears to be the main way local and state officials — and private industry — are looking to meet growing industrial water demand in the Coastal Bend region. Along with the Corpus port, a range of public and private entities plan to construct seawater desalination plants. None of them have broken ground yet. Development corporation officials say the arrival of projects such as Gulf Coast Growth Ventures makes a running conversation more immediate. But while industry groups say such ventures are crucial, the various seawater desalination proposals — the port's in particular — have garnered ample opposition. Critics of the technology are concerned about environmental risks and the amount of energy these plants will require. Jim Blackburn, an environmental lawyer and Rice University professor, opposes the port's proposal because it would involve discharging all the salt and minerals removed from Gulf Coast water into the ship channel near Harbor Island on the northeast side of Corpus Christi Bay, which is zoned for industrial use. "That is killer water," Blackburn said. "Fish cannot survive in that water and it's just the worst place to put it." Charles Bujan, mayor of Port Aransas, is also worried about the effects of that discharge on marine life. 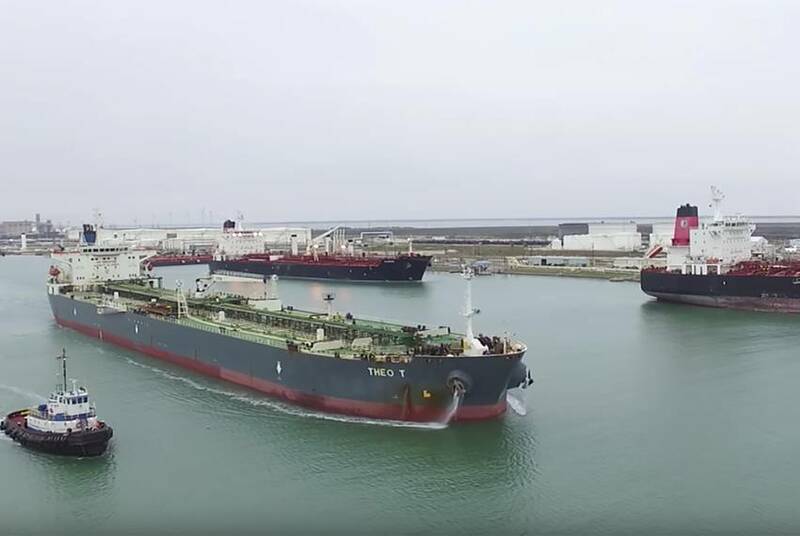 Matthew Garcia, a spokesman for the port, said port officials are working with the Texas Parks & Wildlife Department and the Marine Science Institute at the University of Texas at Austin to "ensure that all risks are appropriately evaluated and mitigated." Garcia added that the port's permit application includes the use of diffuser technology to "adequately mix the brine discharge in the surrounding environment." The port has applications pending before the Texas Commission on Environmental Quality for two proposed sites for seawater desalination plants — one on the La Quinta Ship Channel and another on Harbor Island. Both proposals call for the discharge of water into Corpus Christi Bay. Desalination is a relatively common water treatment method in Texas — there are more than 40 public water supply plants in the state — but only for groundwater, which is cheaper to treat because it is not as salty. Only two seawater desalination plants — one in Florida and another in California — currently exist in the United States, meaning a facility in the Corpus Christi area would be Texas' first. 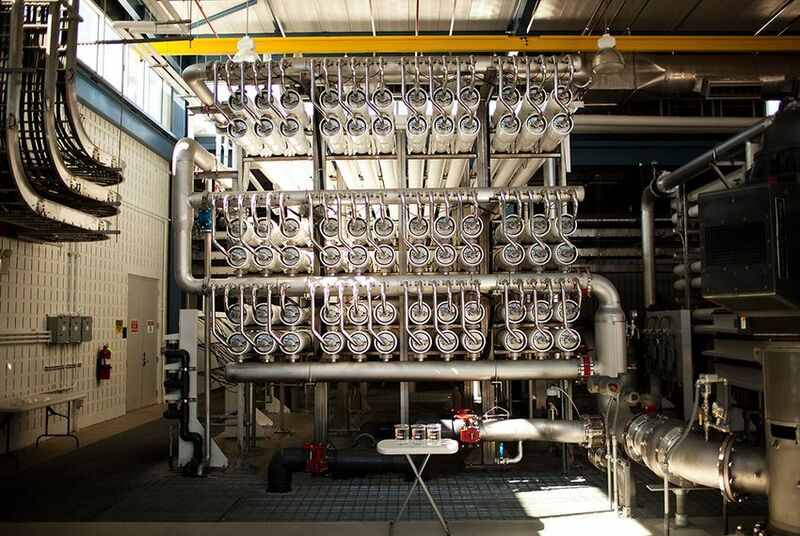 Proponents of seawater desalination have pushed for a plant in the region for more than a decade, and similar initiatives in Texas and around the world have struggled to get off the ground. M&G USA, a plastics company, nearly completed construction of a seawater desalination facility on the edge of Corpus Christi’s port before filing for bankruptcy in 2017. The project was later purchased by Corpus Christi Polymers. Still, production at the plant is unlikely to begin before 2020. Many point to cost as one reason it has taken so long for seawater desalination to happen in Texas. Another reason is that Texas continues to find new ways to stretch its existing water supplies, said Todd Votteler, president of Collaborative Water Resolution, a consultancy. Still, as Texas' population grows and the least expensive water supplies get developed, he said the current supply is going to be stretched even further. The latest National Climate Assessment, released Friday, notes that "Desalination activities in Texas are an important contributor to the state’s efforts to meet current and projected water needs for communities, industry, and agriculture." State Rep. Todd Hunter, R-Corpus Christi, is a longtime backer of desalination in the Coastal Bend. He said water supply is a concern of every business considering locating in the region. The city of Corpus Christi is currently studying five sites for seawater desalination plants, said Esteban Ramos, a Corpus Christi water resource manager. The city would contract out construction of a plant but would eventually run the facility, he said. One challenge for Corpus Christi, a regional water provider, is that it depends on surface water supplies that are susceptible to drought, he said. Average water use for the Gulf Coast Growth Ventures project will be approximately 18 million gallons per day, said ExxonMobil spokeswoman Sarah Nordin. The city of Corpus Christi has indicated there is sufficient water to meet the project's immediate and future needs, she said. According to Lee, the Texas A&M-Corpus Christi economist, water from the seawater desalination plants could cost between $3 to $4 per thousand gallons, meaning Exxon would be paying as much as $72,000 per day. If it were buying water for plant operations from the city of Corpus Christi, it would pay about $40,000 per month for the first 10 million gallons of water used and only $2.20 per thousand gallons over that — or $40,200 per day. Still, industrial customers are willing to pay more for reliable water, said Kevin Kluge, director of innovative water technology at the Texas Water Development Board.